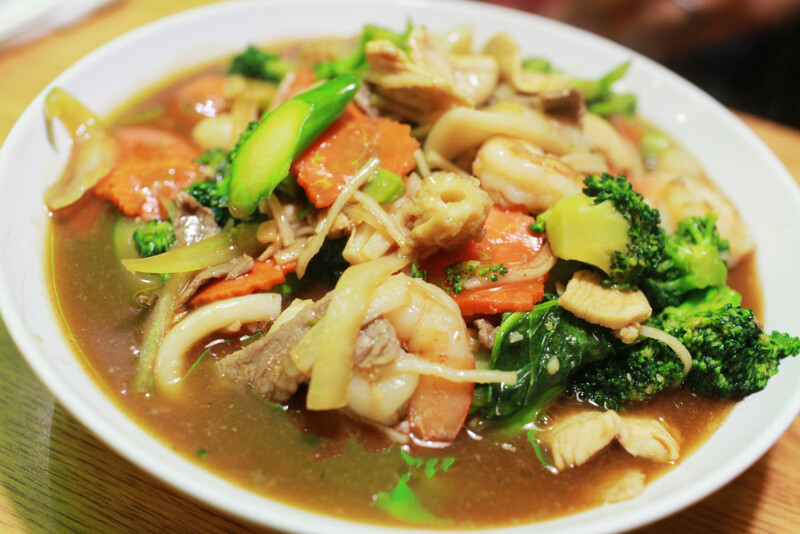 Where can you get authentic Lao food in Atlanta? Pho Lanxang off Jonesboro Rd near the airport is a great spot. 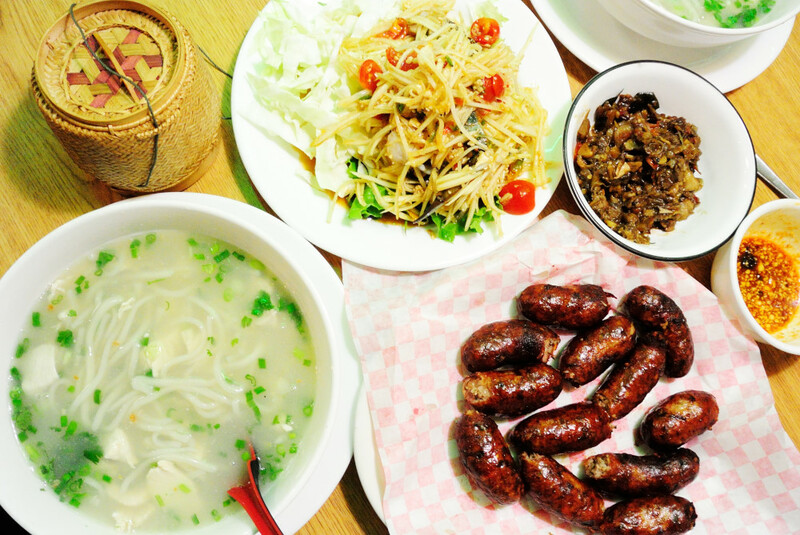 In picking spots to eat at, I always ask myself, “Is this the type of food the workers or locals would have for their own meal?” If you’re craving Lao sausage, or a generous bowl of our greatest comfort food “kow piek” (rice noodle porridge), this is the place. 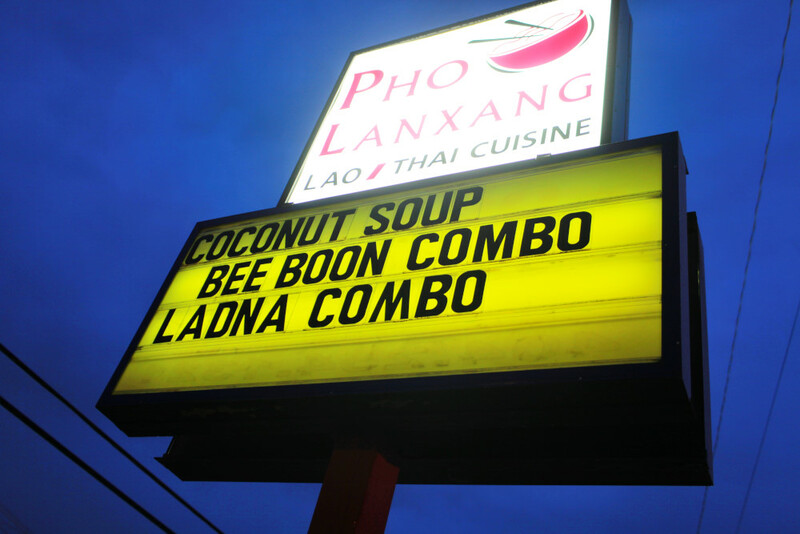 It’s a bit far from us up here in Gwinnett, but this is always on the brain if we have to make a trip to the southside or the nearby Lao temple in Conley. 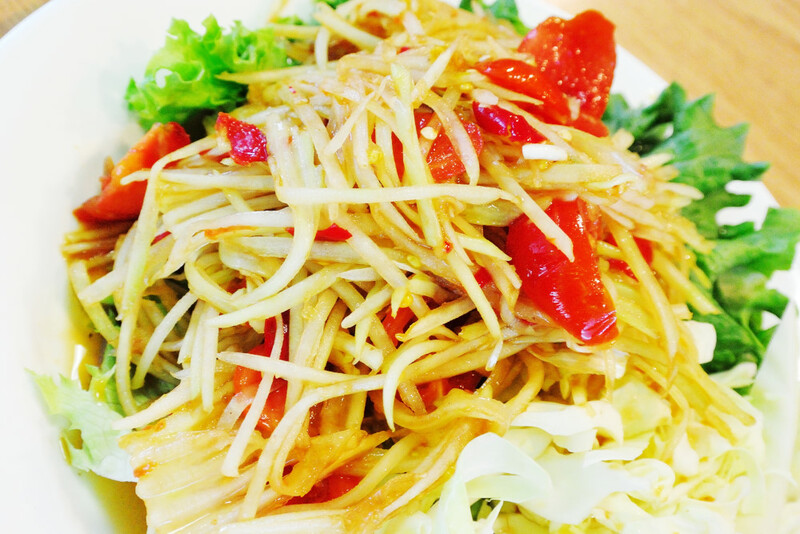 Lao folks could eat “thum mahk hoong” papaya salad every day at every meal. Myself, I’m a big fan the long bean and cucumber varieties, but for most people, the smell of fish sauce and peppers gets the mouth watering. As with all “thum” though, the spice level depends on the chef. What is level 0 to them might K.O. a normal person. Again, Lao papaya salad is one of those things you either love, or not too crazy about. I’ve seen fully Lao-American kids here not eat it at all for whatever reason, and I see my white “Amurican” pals love it and suffer through the sweat and pains. I would put up the Lao Holy Trinity of meals up against any other culture’s meals though: Papaya Salad, Sticky Rice, and Sausage (or swap it out for chicken wings) is probably something I could eat every day. 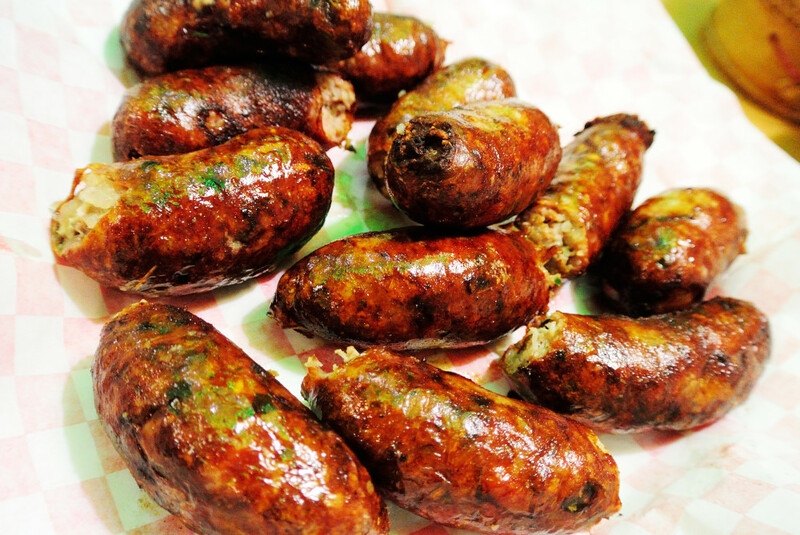 The taste and flavor of Lao sausage depends on the chef, the ingredients, and the way they cook it (grilled, fried, oven). This variety I think is a bit more sour than my favorite ones that I grew up eating. Pho Lanxang also sells these links for a very reasonable price as well. 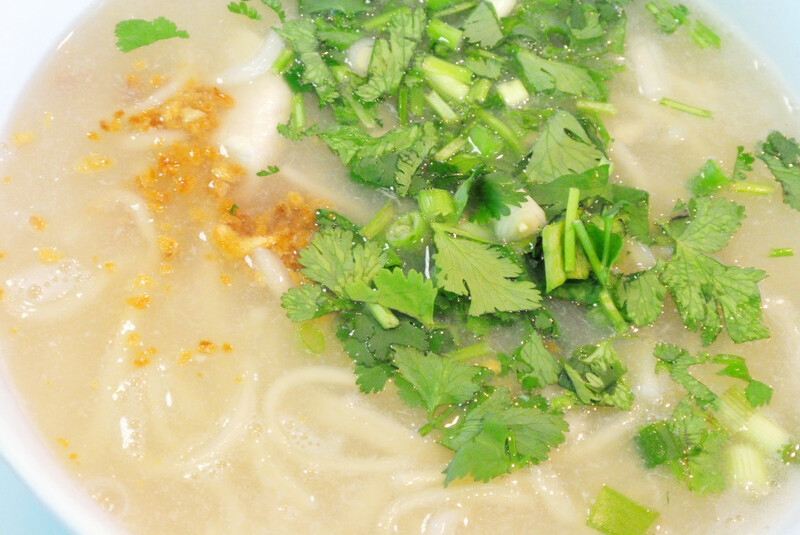 If you are feeling under the weather in some way, this type of Lao meal does wonders. The brown dish is a “jael” (Lao salsa). It’s a bit more complicated than normal salsa, as it could be categorized as a side dish, condiment, sauce, and paste all in one. There are many different varieties but this one is pungent and meant to be scooped out with a piece of sticky rice. Which you use your hands to eat. I know I know, possible germs, but this is how Lao people have eaten for thousands of years. Seafood Lard Nar is also one of my favorites. They are definitely not stingy here with the portions. Whoever came up with eating this brown gravy thick noodle dish with peppers in the vinegar sauce is a genius. Such a great combination of flavors. You can even douse it lightly with “prik nam pba” (diced chili peppers in fish sauce) for a different kick as well. Kow Piek, literal translation “wet rice/rice wet” (Lao Chicken Noodle Soup) is hard to photograph and make look pretty, but believe me when I say when brewed up correctly with the garnish, white pepper, and fried garlic, I don’t think anyone wouldn’t like it. Somewhere at this very moment, at a Lao person’s house somebody is boiling a big cauldron full to feed a house full of guests. You can tell the broth is good from the tenderness of the meat and if the broth needs no extra soy sauce or seasoning. One of the best bowls of kow piek I ever had was in Laos in the mountains of Xieng Khouang when we bought some for these two little scruffy poor kids. The story is still on my other blog. The bowl in Laos was about $.75. 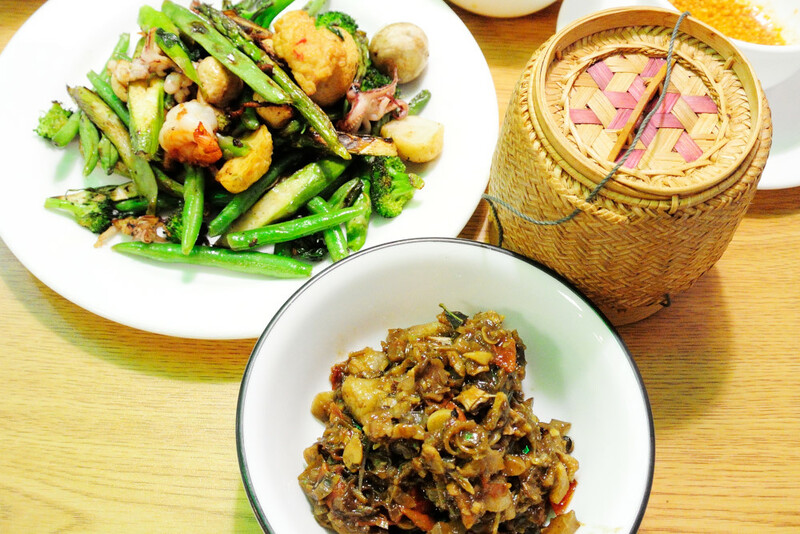 The great thing about Lao food is that it is meant to be shared and eaten together family style. For something that came out of necessity due to limited resources in the old country–I think everyone can learn from it. Too many times in Asian restaurants I see other folks ordering the exact same dish, and never straying from it. 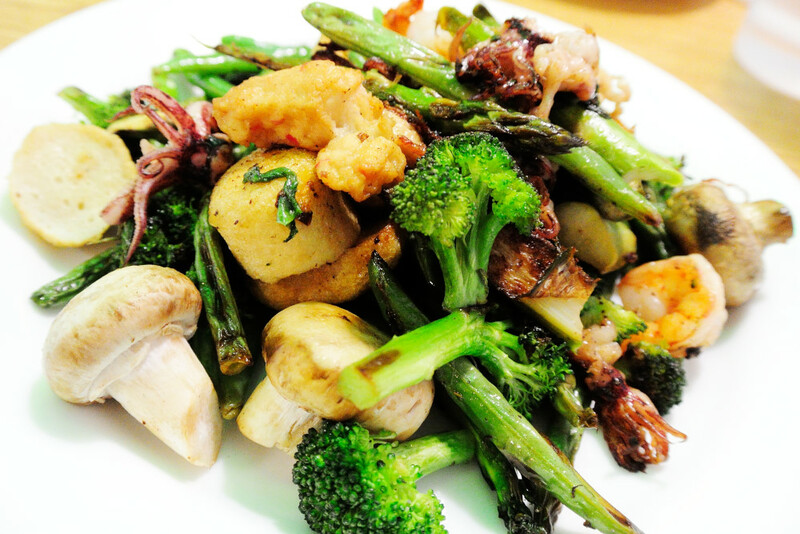 Shared meals, shared experiences and better understanding all around. 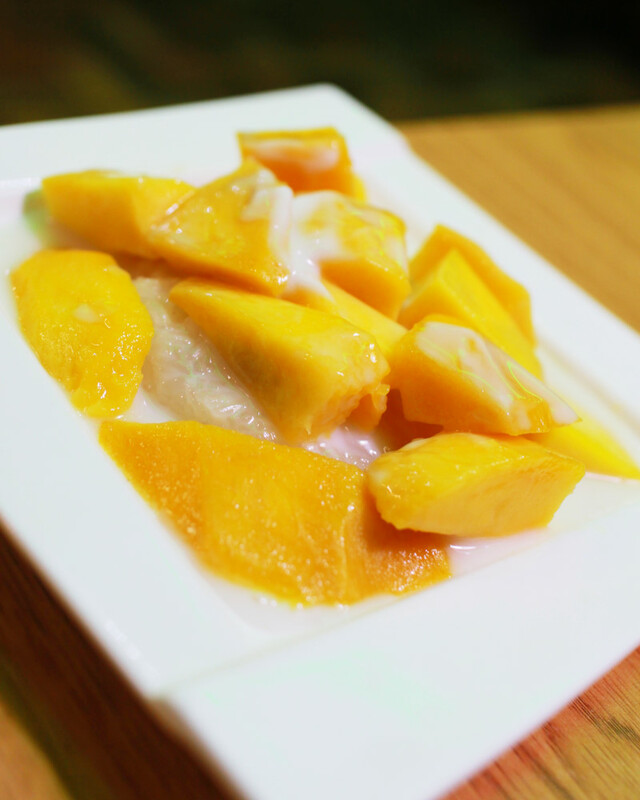 Sticky Rice and ripe mangoes and coconut syrup, one of the greatest desserts ever. What’s odd is, a ripe mango and plain old sticky rice is farmer’s/peasant’s food, sometimes a person’s only meal of the day, but somehow got elevated to restaurant dessert tier.